SCVHistory.com | Tejon | Federal Register: Notice to Prepare EIS for Tejon Indian Tribe's Proposed Casino Project, 8-13-2015. Federal Register, Vol. 80, No. 156 | Thursday, August 13, 2015. Locator map | Click to enlarge. SUMMARY: This notice advises the public that the Bureau of Indian Affairs (BIA) as lead agency and the Tejon Indian Tribe (Tribe) as cooperating agency intend to gather information necessary to prepare an Environmental Impact Statement (EIS) for the Tribe's Proposed Trust Acquisition and Casino Project, Kern County, California. This notice also opens public scoping to identify potential issues, concerns and alternatives to be considered in the EIS. DATES: To ensure consideration during the development of the EIS, written comments on the scope of the EIS should be sent as soon as possible and no later than September 14, 2015. The date of the public scoping meeting will be announced at least 15 days in advance through a notice to be published in the local newspaper (the Bakersfield Californian) and online at http://www.tejoneis.com. ADDRESSES: You may mail or hand-deliver written comments to Amy Dutschke, Regional Director, Bureau of Indian Affairs, Pacific Region, 2800 Cottage Way, Sacramento, California 95825. Please include your name, return address, and ‘‘NOI Comments, Tejon Indian Tribe Project'' on the first page of your written comments. The location of the public scoping meeting will be announced at least 15 days in advance through a notice to be published in the local newspaper (the Bakersfield Californian) and online at http://www.tejoneis.com. FOR FURTHER INFORMATION CONTACT: Mr. John Rydzik, Chief, Division of Environmental, Cultural Resource Management and Safety, Bureau of Indian Affairs, Pacific Regional Office, 2800 Cottage Way, Sacramento, Room W–2820, Sacramento, California 95825, telephone (916) 978–6051, email john.rydzik@bia.gov. SUPPLEMENTARY INFORMATION: The proposed action and a reasonable range of alternatives, including a no-action alternative, will be analyzed in the EIS. The Tribe has submitted a request to the Department of the Interior (Department) for the placement of approximately 306 acres of fee land in trust by the United States upon which the Tribe would construct a gaming facility. The facility would initially be approximately 250,000 square feet, and in a subsequent phase, an approximately 300-room hotel and banquet space would be added. Accordingly, the proposed action for the Department is the acquisition requested by the Tribe. 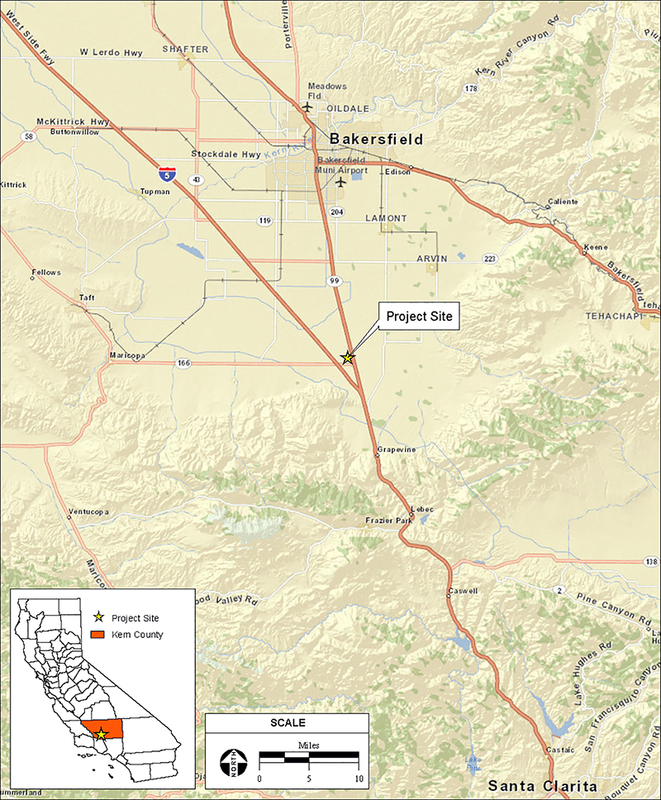 The proposed fee-to-trust property is located in unincorporated Kern County, immediately west of the town of Mettler and approximately 14 miles south of the City of Bakersfield. The property is comprised of four parcels, Assessor's Parcel Numbers (APN's) 238–204–02, 238–204–04, 238– 204–07 and 238–204–14. The purpose of the proposed action is to improve the economic status of the Tribal government so it can better provide housing, health care, education, cultural programs, and other services to its members. The proposed action encompasses the various Federal approvals which may be required to implement the Tribe's proposed economic development project, including approval of the Tribe's fee-to-trust application. The EIS will identify and evaluate issues related to these approvals, and will also evaluate a range of reasonable alternatives. Other possible alternatives currently under consideration are a reduced-intensity casino alternative, an alternate-use (non-casino) alternative and one or more off-site alternatives. The range of issues and alternatives may be expanded based on comments received during the scoping process. Areas of environmental concern preliminarily identified for analysis in the EIS include land resources; water resources; air quality; noise; biological resources; cultural/historical/archaeological resources; resource use patterns; traffic and transportation; public health and safety; hazardous materials and hazardous wastes; public services and utilities; socioeconomics; environmental justice; visual resources/ aesthetics; and cumulative, indirect, and growth-inducing effects. Additional information, including a map of the project site, is available by contacting the person listed in the FOR FURTHER INFORMATION CONTACT section of this notice. Public comment availability: Comments, including names and addresses of respondents, will be available for public review at the BIA address shown in the ADDRESSES section, during regular business hours, 8 a.m. to 4:30 p.m., Monday through Friday, except holidays. Before including your address, telephone number, email address, or other personal identifying information in your comment, you should be aware that your entire comment—including your personal identifying information—may be made publicly available at any time. While you can ask in your comment that your personal identifying information be withheld from public review, BIA cannot guarantee that this will occur. Authority: This notice is published in accordance with sections 1503.1 and 1506.6 of the Council on Environmental Quality Regulations (40 CFR parts 1500 through 1508) implementing the procedural requirements of the National Environmental Policy Act of 1969, as amended (42 U.S.C. 4321–4345 et seq. ), and the Department of the Interior National Environmental Policy Act Regulations (43 CFR part 46), and is in the exercise of authority delegated to the Assistant Secretary—Indian Affairs by 209 DM 8.